British archaeology has enjoyed a surge of interest of late, with the recent unearthing of Richard III in a certain Leicester car park. However, one London archaeological site remains in limbo: the Temple of Mithras is still waiting for its new home, as one of the City's biggest ever digs continues. The temple, dating from 240AD, has been dismantled and is currently in storage with the Museum of London. It's awaiting a permanent home in the rebuilt Bucklersbury House on Queen Victoria Street, which is set to be the European headquarters of media giant Bloomberg LP. Bloomberg was granted planning permission in 2010 to uproot the temple's remains and incorporate them into its new corporate base. 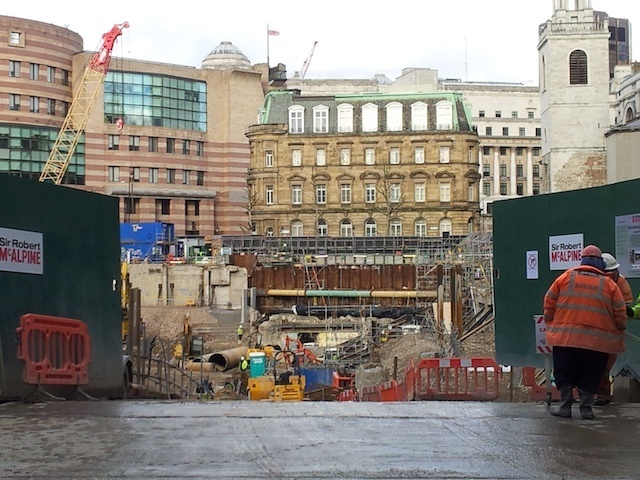 However, work on the £300m project, designed by Foster + Partners, hasn't yet begun. The site, occupying a huge city block, is still a big hole in the ground. Museum of London Archaeology (MOLA), which is leading the project to move the temple, says it will be "a matter of years" before it is once again visible to the public. Part of the delay has to do with ongoing excavation work on the Queen Victoria Street site, which has evolved into the Walbrook Discovery Programme, one of the largest digs undertaken in the City of London, according to MOLA, with more than 50 archaeologists combing through the mud of the Roman River Walbrook. "The ground conditions are perfect for preserving organic remains and hundreds of metal, wood, bone and leather artefacts and wooden structures are being recovered and recorded," MOLA says. "These finds will contribute to our understanding of life in this part of Roman London and will help to tell the story of the development of the Mithras site." The dig has uncovered the original foundations of the Temple of Mithras, which will inform a more accurate reconstruction. "Bloomberg LP will restore the temple to its original Roman location and in a more historically accurate guise," says MOLA. "Upon completion of Bloomberg's new development, the new reconstruction of the Temple of Mithras will be housed in a purpose-built and publicly accessible interpretation space within their new building." There's still no word on what that space will look like, or whether it will take any cues from a similar space designed to display the nearby London Stone, which is also awaiting removal to new premises in a corporate building. The City of London Corporation did tell us, however, that the temple will be in a new display area at ground and basement level with a separate entrance as part of the new building. The Temple of Mithras was dedicated to the Mithraic cult, which spread across the Roman Empire between the 1st and 4th centuries AD. The temple was a low, cave-like building and was in use for about 100 years. It was later rebuilt and dedicated to the god Bacchus. The temple was rediscovered by chance in 1952 by the archaeologist WF Grimes, and caused something of a stir at the time, with crowds of Londoners queuing up to see the dig. On the final day of excavations, in 1954, the team discovered the marble head of a sculpture of Mithras, one of the biggest finds from the site and a key artefact of Roman London. The temple's history has been somewhat chequered since then: put into storage for the first time from the mid-50s until 1962, the remains were reconstructed (badly) 90 metres from the original site, nine metres above the original level and set in modern cement mortar. Chipping away that mortar has complicated efforts to rehouse it: Bloomberg had to hire expert stone masons to free the remains, according to the Museum of London. So, it seems that the temple might be in limbo a little while longer, but it is at least furthering the cause of British archaeology. The Walbrook Discovery Programme has set up a blog to keep people up to date with the dig's progress. And if you can't wait for the site's redevelopment, treasures from the Temple of Mithras – including the sculpture of the head of Mithras – are on display in the Museum of London's Roman galleries.